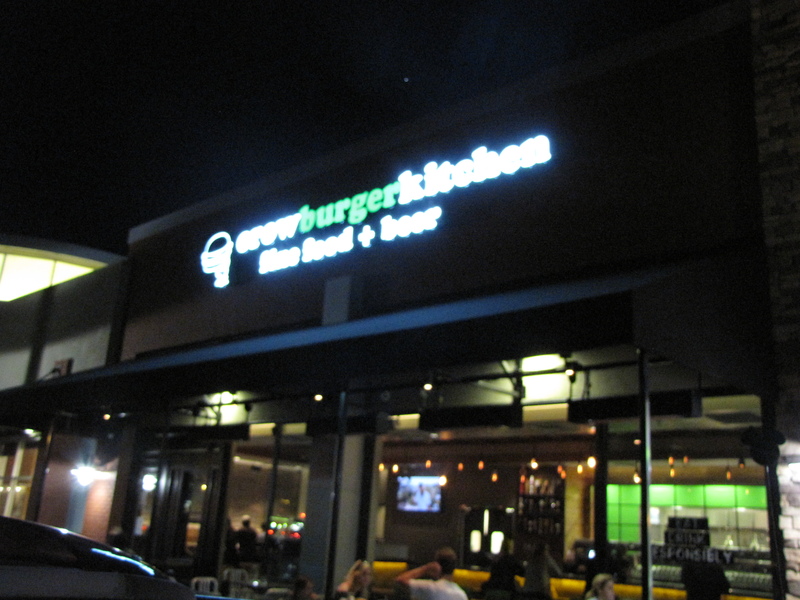 So I got a chance to finally return to the Crow Burger Kitchen in Newport Beach the other night. This time around I decided to do things a bit differently. If you read my previous review of this craft beer burger joint you may remember that I had a couple pints and reviewed them along with the food. This time around I went with the whole family and ordered a flight of 4 oz. tasters to go with my meal instead of going for a full pint. The one I ordered didn't have the egg. I guess that's the "Peninsula Style" difference. Since I was having a flight of beers this time I decided to split my food to allow for more beer. We ended up splitting an Icebox Salad and a Green Label Burger, and we got an order of the Duck Fat Fries for the table. There’s no kids menu, but they made a grilled cheese for the little ones with a side of fries, plus we brought along some fruit and snacks that the kids enjoy, so they were all set. The Icebox Salad is huge, so the half portion was a perfect start to the meal. It is the same salad I had last time, and was just as yummy. They split the burger in the back and brought it to the table on two plates. Wow! They wrapped the burger in paper which made it easy to pickup, otherwise it would have been a challenge. But be warned it’s one of those burgers that once you get a good grip on it, you’re better off not putting it down for fear that it’ll fall apart. (Which was tough with kids to attend to, and beers to drink.) If looking at the photo is making your mouth water I’m not surprised. The burger tasted as good as it looks. It’s hard to go wrong with that combo of toppings, (mine didn’t have the fried egg). I failed to mention it last time, but Crow Burger offers 4 oz. pours of everything on tap. So I decided to create my own flight of IPAs from their beer menu. They had 7 different IPAs on the menu, (along with all the other choices). But I only planned on drinking a pint, so I chose four IPAs for my flight. The Stone Cali-Belgique was a very light IPA, not the hop-forward stuff that I’ve come to expect from Stone, but it was still a very good beer. I’d probably pair that with fish, or something lighter than a burger if I got it again. Might be a good one to have at home with Mexican food. Russian River IPA was my least favorite of the four. More bitter, and not as crisp a bite as I like in my IPAs. It reminded me of the Russian River Blind Pig, so if you like that beer then this is similar. But I prefer the flavor profile of Russian River’s Pliny the Elder. Along side the others in this flight the IPA fell short. The Firestone Walker Union Jack was my favorite of the group. Well rounded, hoppy, and balanced throughout. Really stood out amongst the others and if I were to get a pint of any of them after the flight, it’d be the Union Jack. Dogfish Head 90 Minute IPA was my second favorite in the line-up. Really hoppy, nice crisp flavor, but just not as smooth as the Union Jack. It was the highest ABV of the bunch, so maybe that played into it as well. A double/imperial IPA at 9% may have been the oddball choice to end my flight. Who knows? Alongside other double/imperials it may fare better. I’ll think about that next time I’m ordering my flight. All in all, it was a great night out with the family. 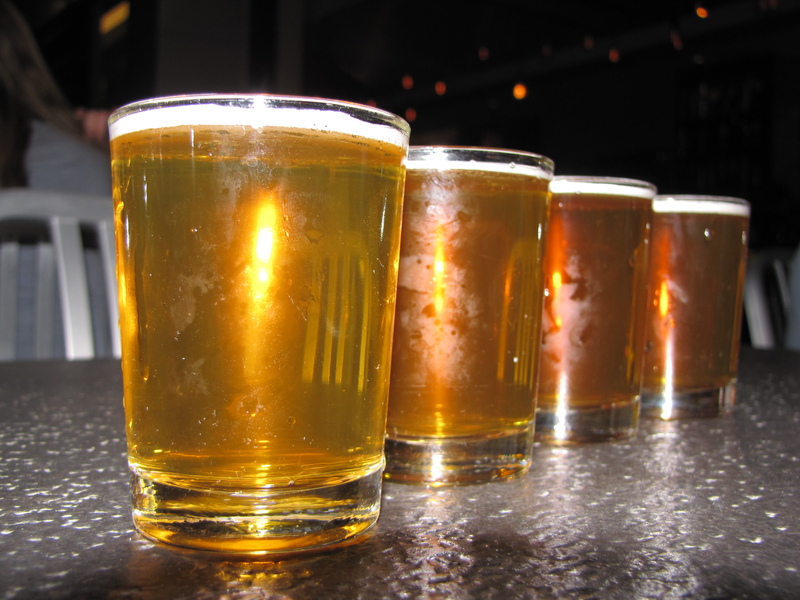 Excellent food, fun atmosphere, and great craft beer. What more can you ask for? This entry was posted in Craft Brew, Food, IPA, On Tap, Review and tagged burger, Crow Burger Kitchen, Dogfish Head, Firestone Walker, review, Russian River Brewing, Stone by Erik. Bookmark the permalink.